6 individual tortes of rich dark chocolate ganache on a crunchy pine nut, coconut and date base. Suitable for vegans and vegetarians. Individually portioned, this dessert gives you the flexibility to serve to one guest or all your guests. 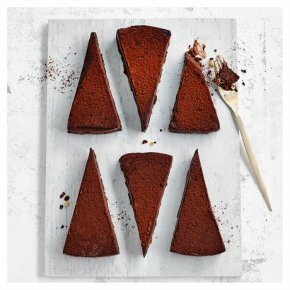 Whether serving to a vegan, vegatarian or guest with no special dietary requirements, you can be sure these decadent tortes will impress. INGREDIENTS: coconut milk, dark chocolate (27%) (cocoa mass, sugar, cocoa butter, emulsifier (soya lecithins), flavouring), dates, pine nuts, water, cocoa nibs, coconut oil, desiccated coconut, rice flour, tapioca flour, emulsifier (sunflower lecithin), fat reduced cocoa powder.